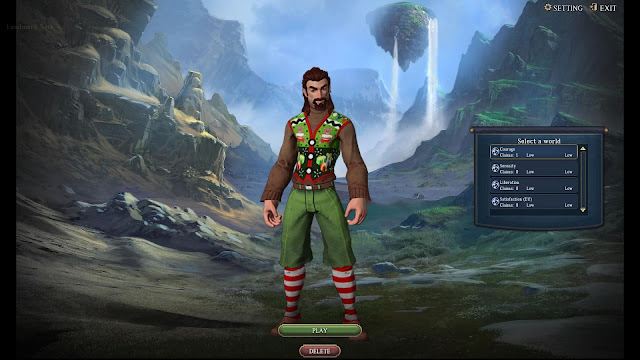 In the recent review of his predictions for 2015 Wilhelm observed that there had been "No word on EverQuest Next" this year. It's true. Apart from the flurry of farewells following Columbus Nova's acquisition of SOE and the subsequent transition to Daybreak Games there's been not a word. This morning when Mrs Bhagpuss popped her head round the door to ask where her morning tea had gotten to she found me playing Landmark. "Why does it still say "Beta"?" she asked. Good question. I was logged into Landmark for several reasons. Tipa first put the idea into my head a few weeks ago. Then I logged in briefly during my updating binge. My old claim was long gone but I found a very nice, convenient spot along the coast, close to the spires. I put my tower back up and left it at that but Landmark has a habit of nagging away at me and I was pretty sure I'd be back. 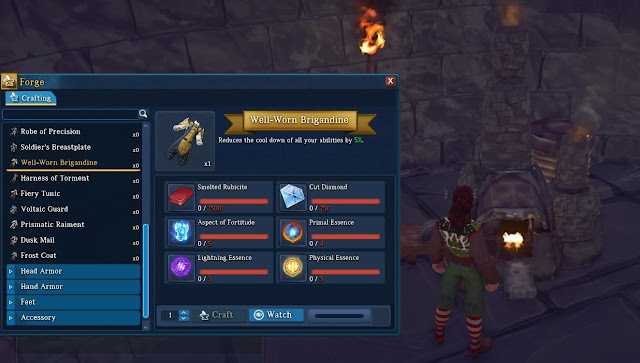 Even in beta we get ugly tank-tops for Christmas. That's always been one of the big problems with Landmark for me. I'm almost painfully aware that I could get lost there and never be seen again. Ever since the first time I stepped into the tech demo that SOE charged a hundred dollars to play I was hooked. Every time I've ever logged in since I've spent longer there than I intended and left only with the greatest reluctance. Indeed, it's been fortunate that Landmark runs like a pig on my elderly and increasingly incapable PC. If doing just about anything there wasn't such an uphill struggle who knows how much time I'd waste, digging random holes and building astoundingly inept and amateurish "buildings"? From this angle you can't see the hideous platform I had to build to fill in the gap where I placed the tower six feet above the slope on the ocean side. Other than the ever-present desire to just pootle aimlessly around in what is one of the most visually and sonically delightful virtual environments I have access to, I wanted to take a little time to see what, if anything, Landmark's current state might reveal about EQNext. It's a bit like trying to identify a plane by the shadow it casts as it flies past five miles above your head but it's not like there's another option right now. So, I spent a couple of hours there this morning and the big surprise is how encouraged I was for the future of EQNext by the time I had to leave. (And yes, it was "had to". If I hadn't had to go Christmas shopping I'd probably still be in Landmark now). Since almost no-one ever writes about Landmark any more and DBG barely mention it either it would be easy to imagine the whole project has been mothballed. If you read the official forums, as I still occasionally do, that's clearly how some of the die-hard, long-timers do feel. From an outside perspective, though, a lot has changed and all of it for the better. The world is just gorgeous. It feels vibrant and alive. Well, vegetationally alive. Due to some inexplicable quirk in the ecology all the wildlife lives underground apart from the birds that flit through the trees and fill the air with birdsong. And the exploding mushrooms. Not sure where they stand in the natural order of things. Today, for the first time, I stood on a hill, looked across a valley and felt the enormous potential. As the baseline setting for new adventures in Norrath what we see now in Landmark would be more than acceptable. Character movement and animation feels great. Running, sliding, climbing, jumping, they all feel natural; intuitive, even. Swimming is possibly the best-done I have seen in any MMO. I had a light-bulb moment on the roof of my tower, when I misjudged a step and my character ended up hanging from the lip of the stairwell by his fingertips. It felt like he'd done that, not me. It's probably something commonplace in other video games but as a pure MMO player it took me completely by surprise. The UI is vastly improved. Just about every element has been re-worked, always for the better. Keys are, finally, completely customizable. The building controls are still a little overwhelming by the very nature of the complexity and flexibility of the system but they are far more intuitive and comfortable than they were. An excellent new visual system for highlighting the voxels you're working on helps a lot. Currently Building still shares UI real estate with Adventuring but they're slated for divorce this month, giving each a dedicated set of controls. Explain to me how it's "well-worn" when I just this minute made it. Crafting has expanded out of all recognition. The crafting UI feels very comfortable and familiar and there's now a slate of recipes fit to do any MMO proud, not only on the building side but for adventurers too, with dozens of different pieces of armor and weapons craftable for every available equipment slot. I could easily imagine this crafting system slotting straight into EQNext even as it stands. As foundation for a more complete system it really does look to be in fine shape. I wasn't planning on doing any fighting but I came across a cave entrance while exploring and couldn't resist. I equipped my bow in readiness but in the event all I encountered on the upper levels were more exploding mushrooms. Using those for target practice I'm surprised and delighted to say that I felt more at home with the mouse-button action combat than in any other version I've tried. Again it did feel almost unaccountably natural to use. The giant calipers that appear every time you fight everything remain an appalling eyesore that needs to go but at least now they vanish after a time on their own when you stop fighting. Get rid of those and combat would be in a good place for me, visually. How well it would work in gameplay terms I am never going to know until I upgrade to a system that won't freeze up with other players around. Assuming, that is, that EQNext is going to have something other than solo fights. There were lots of highly encouraging little touches that I hadn't seen in previous visits. I found two chests in the first cave I entered, which felt ridiculously exciting and satisfying. They contained mostly large amounts of crafting mats, the things you'd mainly have gone down into the caves to mine and harvest in the first place, so that made an unusual amount of sense. 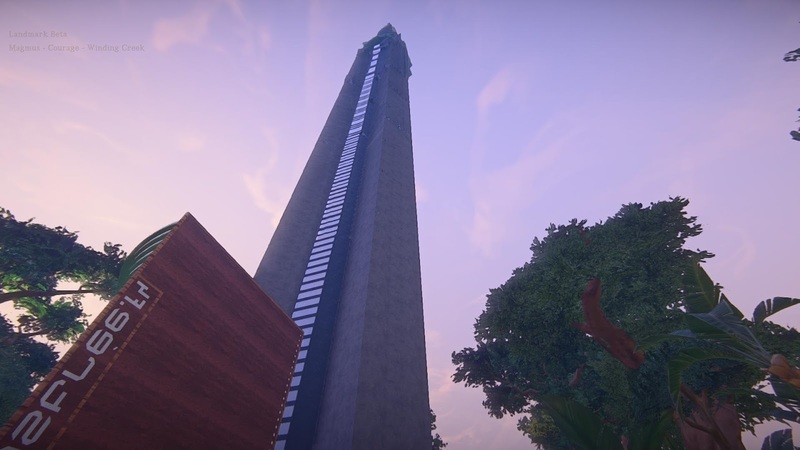 "Loosely based on the CN Tower Toronto" . Looks a lot more like it in-game than any screenshot I was able to take would suggest. As I explored above ground there were occasional eruptions and explosions that startled and confused me until I realized they were mining events. 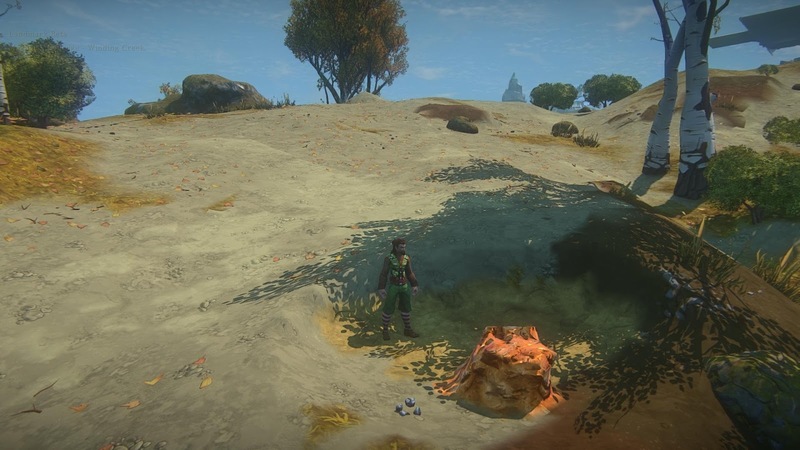 A large lump of copper ore popped up like a boil at one point and several small craters opened up beneath my feet. All of them gave what appear to be bonus hauls of ore or stone. It made traveling feel very lively. I'm not quite sure what the provenance was meant to be but loot is loot! One area where Landmark and EQNext will have to improve radically is the ability of the engine to display objects at a distance. I visited several heavily developed claims (there seems to be a lot of activity going on still on the building front) but it was impossible to guess what any of them would turn out to be until I was standing right next to them. Further away than a hundred yards or so all anything ever looks like is melted plastic. When I was at university it took seven years to become an architect. Here it's more like seven minutes. After a couple of hours I came away feeling optimistic about EQNext. It's a concern that there may be problems both with the Forgelight engine and the in-house voxels that lead to sluggish performance. I've read complaints along those lines. Given the extreme inadequacy of the system I'm using to explore it, though, Landmark seems to be holding up pretty well. By the time EQNext eventually emerges, something no-one in their right mind would bet on happening next year, I should have a machine capable of running it efficiently. Judging by the reflections of Next that Landmark casts on the water I feel confident in predicting that, yes, come the day, I will return to Norrath once more. And enjoy it. I loved my time in Landmark and this is a reminder I should go back in. I haven't since combat was introduced. 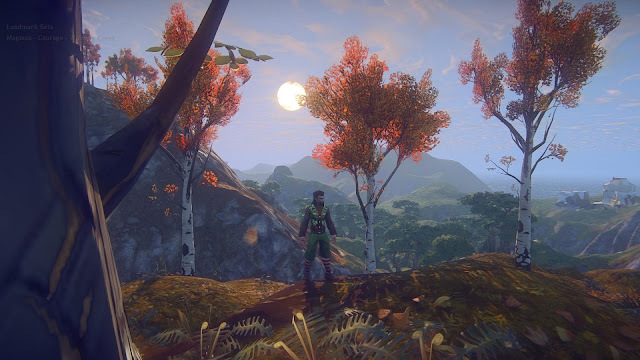 I am still loving TLP servers in EQ, but I am so cautiously optimistic about anything EQNEXT. Emphasis on cautious. It is so hard to trust that anything is (or will) happen(ing) there... still, dare to dream. I logged onto Stormhold for the first time in ages at the weekend and bought a bunch of Frostfell furniture for my SK's inn room. Then I did several stages of the Ratonga racial storyline in Temple Street (surprised that's available on Stormhold). Pretty pointless seeing I could do any of that on a Live server but it was fun all the same. 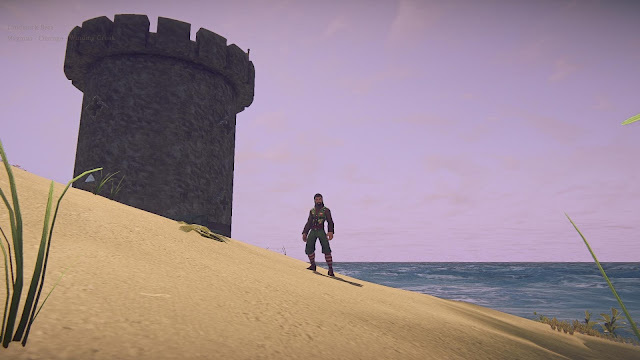 Landmark - the endless beta. As for EQN, I don't believe in that any more. It's one of my 2015 predictions really and am still expecting Daybreak to do a Titan on this project. Is there anything at all to suggest otherwise? The key reason to think something will eventually appear with an "EQNext" label attached has to be Columbus Nova. They clearly didn't buy SOE just to run the existing games and there were no physical assets to strip (real estate). The only way they can get a return is either to have DBG launch something that makes a lot of money or put DBG into a position where it looks to someone else as if it will, then sell it on. Assuming you write off any meaningful growth from the two existing EQ titles you're left with DCUO, which is a licensed deal DBG doesn't own (as far as I understand it), Planetside2, which is going downhill fast, H1Z1, which has potential but may already have been tapped for much of what it's worth and EQNext. Oh, and whatever mysterious project they are secretly working on. Blizzard were in the very fortunate position of being able to afford to write off the development costs of Titan. 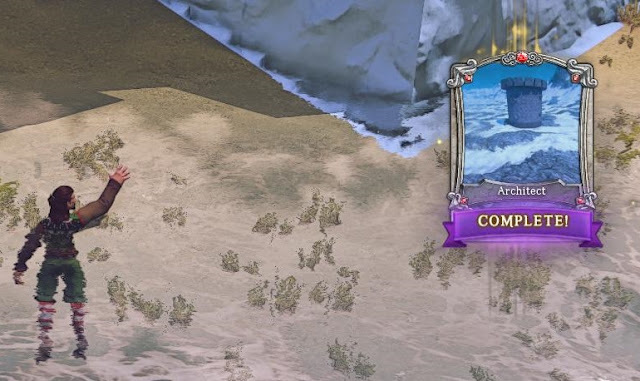 If DBG literally can't produce EQN due to technical shortcomings, which I wouldn't rule out entirely, then they might be forced to do the same but short of that I would say they have to launch something at some point. Whether it's something anyone will want by then is another matter. Yeah I see that. It would be utterly bizarre to see SOE sold to a company that then never made anything out of it really, rofl....but stranger things have happened. Tangentially, have you heard about the secret project Dave G. and Jeremy Soule have teamed up for? What's your speculation? I somehow got the impression it had nothing to do with gaming as such. I imagine it's Dave Georgeson indulging his very obvious Mick Jagger fantasies in some kind of vanity project. 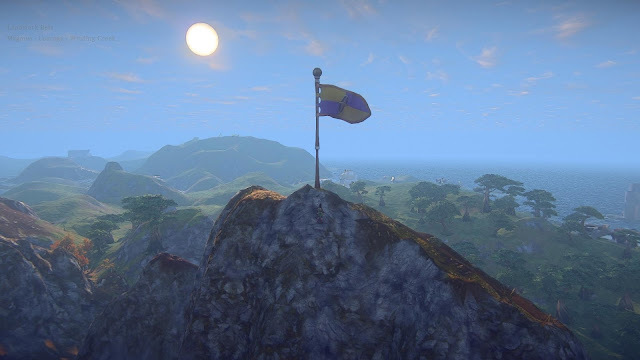 I'm very firmly in the camp that feels the departure of both DG and Smed from Daybreak in general and the EQNext project in particular can only be a good thing. I'm very much not a fan of super-strong, cult of personality style leadership, which both of them exemplified during their time at SOE amusing and entertaining though it always is to watch and comment on. As a customer, I much prefer the current, quiet, more professional approach we're seeing these days. I think the EQ franchise feels steadier and more stable now than it has since around Planes of Power.